Japan’s SoftBank Corp announced the appointment of Nikesh Arora, previous head of investments, as president in a management reshuffle. Arora has also been named as a potential candidate to take over as CEO from Masayoshi Son at a time when the telecommunications giant is looking to step up international expansion. The reshuffle will also include the move for Ken Miyauchi from president and CEO of SoftBank Mobile Corp to director of the company and the resignations from the board of Yoshimitsu Goto and Kazuhiko Fujihara on June 19th of this year. Board member of SoftBank PrinceVille Investments (whose major investor is SoftBank Group) Mukesh Valabhji will retain his current position. Mukesh has a number of business interests including further telecommunications investment in Intelvision in the Seychelles and investment in real estate, hospitality and trading interests across the globe. Mukesh has also being exploring a new $250 million taxi booking service investment from Japan’s SoftBank. Nikesh Arora was hired by SoftBank Corp in July 2014 to head up a brand new unit, SoftBank Internet and Media Inc. Coming from a leading role at Google Inc., Arora has enjoyed much success and recognition throughout his career. In 2012, he was able to boast being one of the most powerful and well-paid executives at Google, with earnings that year of $51 million in combined cash and stock. 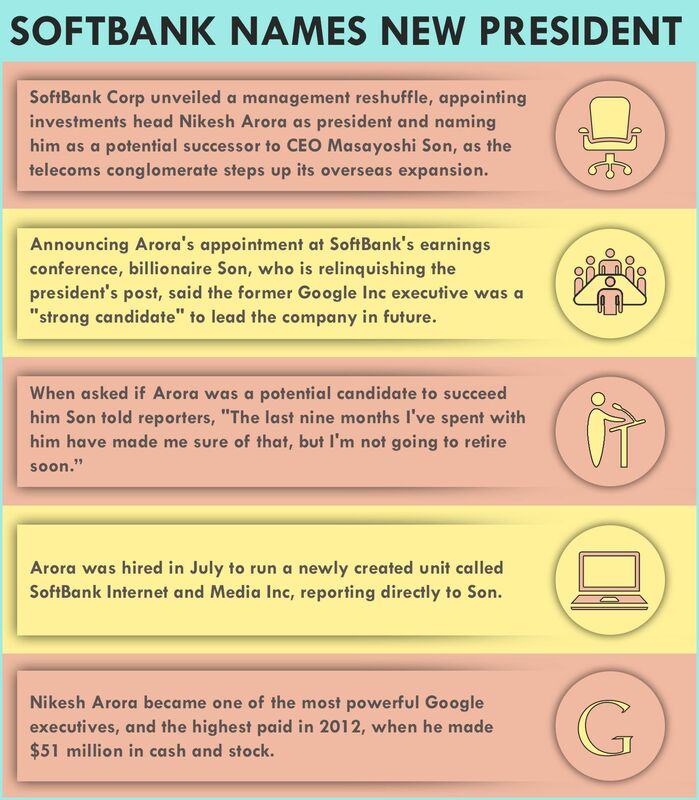 Billionaire CEO of SoftBank Masayoshi Son who relinquished the post of president to make way for Arora said of the young executive that he was a “strong candidate” for the future leadership of SoftBank Corp, although he was careful to add that he had no plans to retire anytime soon. Arora has previously worked in a number of senior roles from vice-president to CEO, president to director. His experience lies mainly in internet and telecommunications sectors, having worked not only for Google Inc. but also for T-Mobile and T-Motion, Sprint Corporation and several investment firms early in his career. The news of the management reshuffle at SoftBank Corp came at a time when a sluggish economy within Japan saw the Group struggling to make the 2013 acquisition of Sprint Corp profitable. The $20 billion acquisition is now forcing SoftBank to consider looking overseas to create more potential for growth. The long-haul revamp of the Sprint network has so far cost thousands of jobs and thousands of subscribers into the bargain, with stiff competition from larger rivals from the US such as Verizon Communications Inc. and AT&T further exacerbating the problem. Nikesh Arora was appointed director of Sprint Corp in November 2014 alongside his role as CEO of SoftBank Internet and Media Inc.
SoftBank has made a series of investments in recent years, including $600 million in Kuadi Dache, a Chinese taxi-hailing app operated by Travice Inc., $250 million in Legendary Entertainment, a privately-held movie studio in Hollywood and the acquisition of the largest content portal and search engine in Japan, Yahoo! Japan. There are also plans underway to invest $10 billion across the under-developed online retail market in India which has the potential to be huge, alongside existing investments in Alibaba Group Holding Ltd, the Chinese ecommerce giant. SoftBank Capital is also behind the PrinceVille Investment Fund, which closed in February 2013 and of which Mukesh Valabhji is a board member. The PrinceVille fund is bringing $250 million of global investment in growth stage media, telecommunications and internet businesses looking to expand into the mature Asian market. This includes investment in companies in the social media, gaming, ecommerce, cloud computing, online advertising and mobile applications sectors. The PrinceVille Fund was launched by SoftBank Capital to complement ongoing efforts in early stage investment, concentrating instead on established, growth stage companies with a desire to enter the Asian market. SoftBank Capital invests in companies across a variety of technology sectors with focus on those businesses that increase connectivity between people, devices and the world. Since 1995, SoftBank Capital has invested heavily in a wide variety of companies, with recent prominent exits including ZipList, OMGPOP, Buddy Media, Huffington Post and Hyperpublic. The inter-relation between the PrinceVille Fund from SoftBank Capital and SoftBank Corp brings about unique positioning for those companies being funded, to access a wide and well-established network of leading internet, telecommunications and media companies within the Asian market in order to drive rapid growth. Western-based companies are also able to take advantage of a wealth of local knowledge in a market that is often inaccessible due to its unfamiliarity, accessing strong guidance when formulating expansion plans in countries such as China and Japan.